Several new products have caught our attention to help preserve your edible harvest. Weck canning jars are made with thick glass, including the lids—so no more rusty lids. 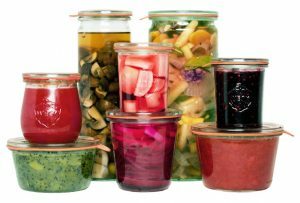 Available in a variety of shapes and sizes with wide easy-to-fill openings, these are stylish enough to serve straight from the jar. (kaufmann-mercantile.com). The Debbie Meyer GreenBags, the “As Seen on TV” green storage bags that reduce the ethylene gas emitted by fruits and vegetables, have expanded the product line. The GreenBoxes use the same system, but in a container form. The GeniusVac helps eliminate freezer burn by removing the air from freezer bags using a cordless hand-held vacuum sealer. (debbiemeyer.com). Dehydrators are making a comeback with new styles and faster results. The Excalibur Dehydrator, available in a variety of sizes and colors, including pink and blue, features a 26-hour timer that lets you set it and forget it and an adjustable thermostat low enough to preserve active enzymes in fruits and vegetables but high enough for dehydrating meat for jerky. (excaliburdehydrator.com). When it’s time to compost your food scraps, the GreenCycler is a new countertop pre-composter. With a few turns of the handle, the unit’s stainless-steel blades quickly shred the food, beginning the recycling process before adding it to the compost pile. (thegreencycler.com).